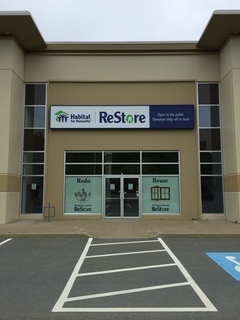 Please use this calendar to sign up for a ReStore Volunteer Shift at the HALIFAX location. Please only sign up for a shift if you have been to an orientation with the Volunteer Coordinator. Please make sure to sign up for or cancel a shift at least 1 week in advance. If you need to sign up or cancel within 1 week of the shift, please email volunteer@habitatns.ca. Through volunteer labour, efficient management, sponsor funding and donations of money and materials, Habitat for Humanity builds safe, decent and affordable houses with the help of the homeowner (partner) families. Habitat houses are sold to partner families at no profit and are financed with affordable, no-interest mortgages held by Habitat Nova Scotia.Homes are built in communities where land availability allows either through donation or discounted purchase.Habitat for Humanity is a hand up, not a hand out. In addition to mortgage payments, each homeowner invests hundreds of hours of their own labour, called “sweat equity”, into the building of their home and the homes of others.